-Have several crates in living area and sleeping area. If trouble happens, pet parents can send dogs to crates or throw them in the crates if necessary. http://farm8.staticflickr.com/7183/6884135006_b3d1778042.jpg. 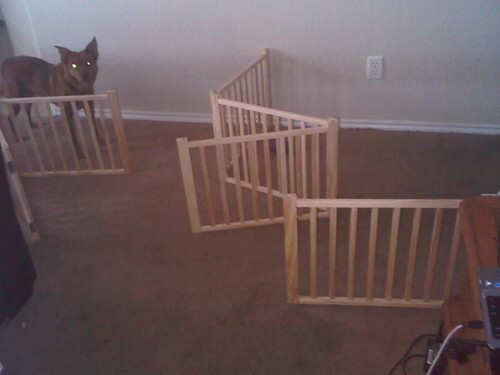 These gates are lightweight and can be easily picked up to put in between dogs as well. This might bunch dogs up even more so use with caution. - Also keep blankets in various places around the house. They can be tossed on top of fighting dogs to distract them. Use it if you see any signs of trouble. Stiffening, hard eyes, lip curl, etc..
only for series fights. not scuffles. How do you keep things calm in your multi dog household?